Uncovered is the first memoir to tell of a gay woman leaving the Hasidic fold. In understated, crystalline prose, Lax begins her story as a young teen leaving her liberal, secular home to become a Hasidic Jew. She plumbs nuances of arranged marriage, fundamentalist faith, and Hasidic motherhood. Throughout the narrative, her creative, sexual, and spiritual longings shimmer just beneath the surface. In Uncovered, Leah Lax tells a personal story that millions of women can recognize. All over the world are women whose bodies are covered, not by their own decision, but by one of the many patriarchal religions that by definition rule their wombs. Leah Lax lived that life, yet has the spirit, courage and honesty to tell her story. It’s been said that, if one woman told the truth, the world would split open. If others follow her, it just might. This calmly told, beautifully detailed memoir limns [Lax’s] movement from lonely child to young bride; from dedicated wife, mother, and supplicant to soul-searcher; and from denial to full acceptance of and delight in the real her. Absolutely stunning! With memorable, passionate detail, Leah Lax recounts a unique search for wholeness and healing that paradoxically plunged her into the quicksand of shame. Written in poetic prose whose color and savor will linger long after you finish the book, this memoir makes the flickering appeal of a life of inflexible rules as seductively clear as it is claustrophobic―a remarkable achievement. Dramatic, revelatory, deeply moving, and ultimately inspiring, this is a truly one-of-a kind memoir about the universal longing to discover, nurture, and celebrate one’s authentic self. In this courageous, important book, Leah Lax reveals a voice once doubly silenced by orthodox religion―as a woman and a lesbian―on a deeply moving journey to selfhood. Should be required reading! This is a remarkable book. Aching, absorbingly told, and with genuine tenderness toward the damaged, struggling, and sometimes helpful souls who populate a life, Uncovered is a marvelous memoir, one in which any reader will find echoes of our own quests for an authentic life. 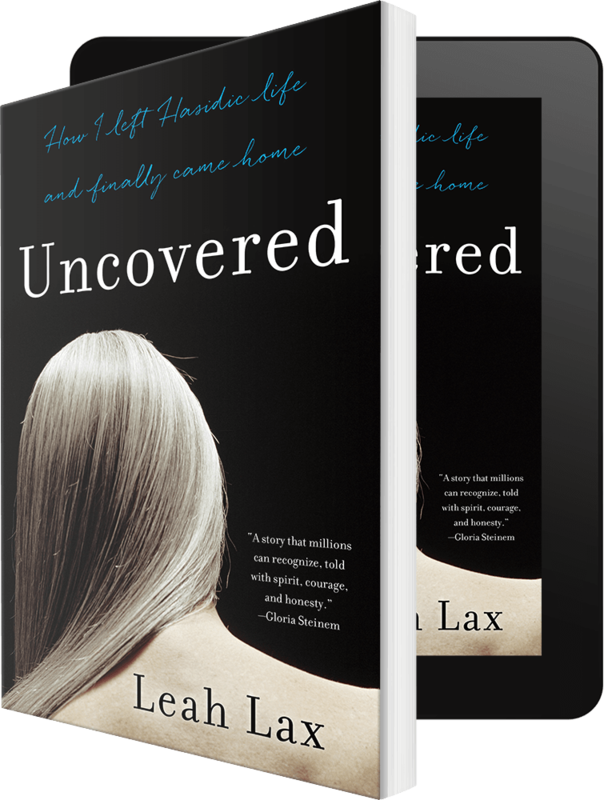 In Uncovered, Leah Lax remembers in rich detail how she moved from loneliness through what promised to be a new family and a new community, into a pure appreciation of the world―and how, instead, it suppressed her deepest needs. Her book is a profound and poignant story of innocence and experience, those ancient universals, and transforming joy at the end. Class fills quickly. Sign up now! We’ll build our fictional worlds together, line by line, with lots of food and laughter and sharing. Leah Lax shared a link. Opinion | Measles Breaks Out Among Yeshiva Students. Where to Begin? After accusations of low standards and a measles outbreak, Orthodox Jewish schools want less oversight. The New York State Assembly and Senate have passed a bill banning conversion therapy for minors, which Governor Andrew Cuomo will sign into law soon.